We have always made our own baby food at home but my son actually was never really in to the stuff we pureed, it seemed because of the texture. He very quickly went on to eating just small pieces of the meals my husband and I were eating. So when I received Ella’s products I was pleasantly surprised that he loved not only the texture but the taste of each kind. And on top of that, it made me feel good that the entire line is not only organic but healthy–retaining vitamins by keeping the cooking temps low and completely free of additives, even water! I mentioned how much we loved Ella’s Kitchen at my recent Stroller Strides class (filled with new moms!) and one mom said she SWEARS by Ella’s–even for her toddler. It’s so handy to throw in the diaper bag for snacks and just helps get those extra servings of fruit and veggies into her daughter. And now I can honestly say, I agree. 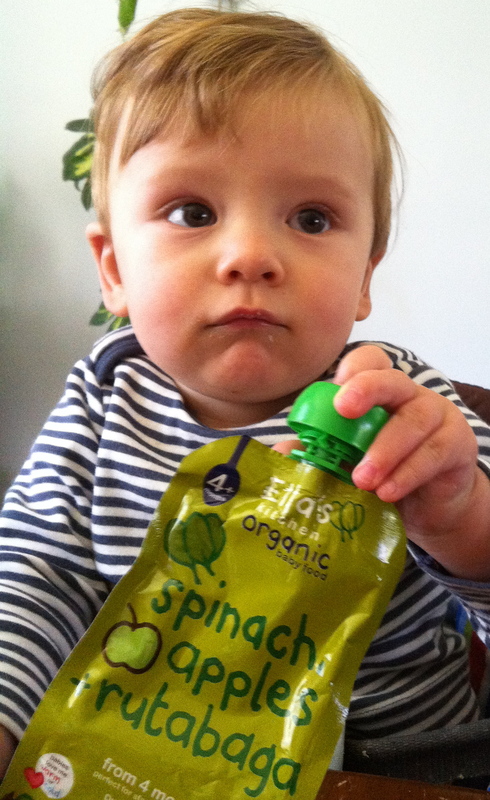 I now recommend that every parent at least try them out–even if you’re sticking to making your own baby food. It never hurts to have a couple packages to take along with you, when you’re rushing out of the house and don’t have time to get out the food mill or processor. Visit the Ella’s Kitchen Website for more information. And you can buy Ella’s Kitchen Organic Baby Food online at Amazon, BabiesRUS and Diapers.com and can find local stores that sell it here. Enjoy!